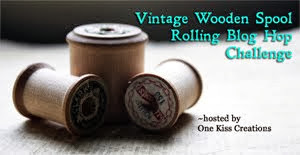 A month or more ago I got an intriguing e-mail from Christine of One Kiss Creations asking if I would be interested in participating in a 'rolling hop' using some unconventional items she found while out antiquing. Obviously, I couldn't resist a challenge like that and replied instantly with a resounding YES! I revealed my rolling hop challenge items (along with all the other goodies Christine included for me) almost a month ago. With both of the spools I used, I felt the need to alter the empty portion where the thread used to be. And, in both cases I used paper to do so. In the first, it was some delicate, yellowed, French text from a book. I can only pick out a few of the French words, so I hope it's not nasty. For the rest of the necklace I wanted to stay simple and play off the sewing theme, so I pulled a little from my abundance of buttons. Sticking to vintage mother of pearl buttons, I stacked them above and below the spool, created a chain, and dangled one from the spool. 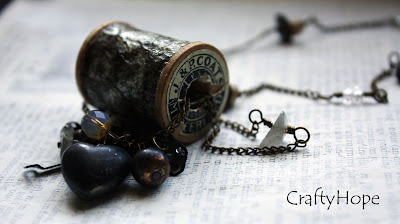 I also finished off the chain with some small wood beads and a dainty, vintage-looking brass clasp. Weirdly enough, before Christine ever mentioned a challenge or told me what the challenge materials would be, I had already sketched out a spool necklace design. Though what I ended up with isn't exactly what I drew, it's really close! My sketch used wire instead of the chain, but this worked wonderfully. And, I may still use wire idea eventually with the other spool. Again, I altered some paper for the center piece. This time it was some dictionary text, though you can't really see it for all the altering I did to the paper. I think the technique worked wonderfully and I'll share the process I used later. For now, it's all about these spools. I finished the necklace off simply with more chain and a few wire-wrapped beads. The dangles are just a random collection of beads, charms, and found objects that I thought went well with the tarnished/sparkly feel of the paper. I've already worn this necklace out and am really in love with it. Now, I still have that one spool from Christine left and plan on using it at some point for sure, but I didn't want to try to force inspiration. Instead, I'll just let inspiration find me. Here are links to the twelve other participants in this rolling hop. Right now, Janet and I are the only ones who have revealed. You can also just keep an eye on Christine's blog to find out when they roll out the reveal of their creations. Janet from Honey from the Bee was the first to reveal on her blog. You can also check out what Christine had to say about Janet's reveal. Thanks to Christine for the awesome challenge and thanks to you for stopping by! What would you do with wooden spools? Oh Hope! YES!!! These are SO so wonderful!!! I just adore your style of jewelry (or should I say j'adore?! LOL). Each and every piece has a past and is present and tells a story. The use of the paper on these is just fantastic...I have had a lot of ideas as to what to wrap around these but I never thought of paper. The buttons make the perfect chain for the spool. The color scheme, and the hidden words on that second one are fantastic...it must have some good movement too. I am thrilled you said yes to this hop, but I knew you would...I had you at "antique store" ;-) Thanks so much for your time and your talent. I *Love* it here at Crafty Hope! I love what you did with the spools and it is so you with the text paper. Ah so if the French is a little racy it adds spice. I like that you made one of the necklaces with buttons, another signature of your style. Great job on both. Hope - these are wonderful! They have a very Victorian feel to them which j'adore! I'd wear both of them. You transformed them into elegance! Janet - You are too kind. I had so, so much fun with this challenge and am even thinking of adding spools to my regular rotation of materials. They make such a good medium. And, I know I'm going to get all kinds of great inspiration from these other designers!! ;) Thanks again. Beautiful, Hope! 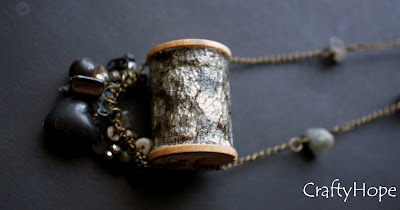 I love the wood and mother of pearl color and texture of the first piece, and I think the way you turned the spool on the side for the second piece is just brilliant! I LOVE the swooping chain with all the dangles under the spool. Really, really lovely work! Erin - Thank you! This was such cool challenge. 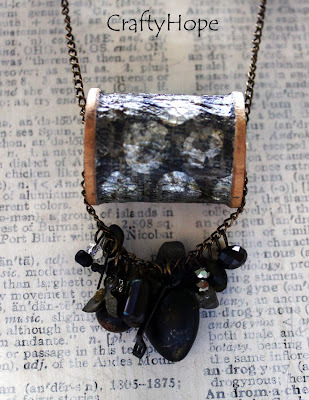 I'm so pleased that I was able to make a unique material become jewelry. And I enjoyed every minute of the process. The fact that you like what I created means so very much to me!! Thanks again. Candy - Thanks so much!! It was a great medium to work with. Both of those are beautiful. They work so well with the different chains. I love the pages around the middle of the first spool and the buttons -- it's perfect. I also love the dangles on the second and that you used it horizontally. I want to do that with my last one. Just love how you've embellished Christine's spools with paper, which you've taken to a new art in your second piece. Looking forward to hearing about your technique. And your finishing touches for both pieces are simply perfection! Cynthia- Thank you :) The paper seemed like a natural choice to me, but that's just the way I think. I don't know what it is about paper, but I love the stuff. (I've always been a bookworm.) The necklace was totally fun and my best friend who was with me when I wore it said it was a totally me necklace. Ha! Oh yes - the first one with the buttons is awesome! I would have absolutely no idea what to do with those spools-fantastic! What clever use of those spools! I love what you did - but especially the french word spool. It's so neat! I love what you have done with both spools! The buttons make a fabulous chain. Turning the second one its side is so unique. Nice work with Christine's challenge! Both pieces are great! What I really love is that you managed to transcend time. You kept the essence of the age and mystery of the spools. Atmosphere. Your necklaces both have tremendous, wonderful atmosphere. Wow. GREAT interpretation!!! Liz- Thank you so very much! I really loved the medium Christine presented us with and may actually add the spools to my regular supply list. I like the opportunity to add a little 'art' to the middle of them. I'm so happy you like what I did with them as well. Thanks again! Oh wow! Those little spools got all dressed up ;) What beautiful work you do... I think the first one is my favorite. Squeal! Love, love, love this idea! Never would have thought of paper, and it looks soo cool. They are both so different too! You rock girl! Shirley- You're too cute! I've actually been trying to think of something OTHER than paper to alter the inside of my last spool but keep coming up with a blank (or really bad ideas). I'm super interested in what the rest of the hoppers do with these babies. Thank you so much for your sweet words.